Tennessee cave salamander; official amphibian symbol of Tennessee. Photo by Alfred Crabtree/Flickr (Use Permitted with Attribution/No Derivative Works). The Tennessee cave salamander has three red external gills, a broad, flat head with small lidless eyes, and a tail fin. Coloring ranges from nearly white to dark brown with spots. 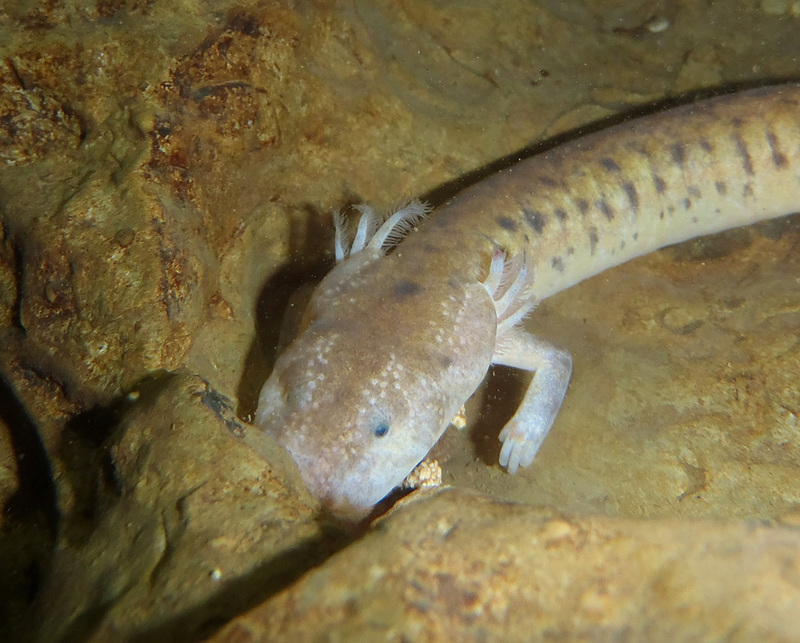 This large salamander (4 - 9" long) is usually found in limestone caves containing streams in central and southeast Tennessee. Salamanders breathe through their skin and are very sensitive to their environment - they have little tolerance for environmental pollution. A recent study estimated that salamander and frog populations around the globe have decreased 60-70% over the past few decades. The Tennessee cave salamander (Gyrino-philu palleucus) is threatened and under consideration for listing as an endangered species. 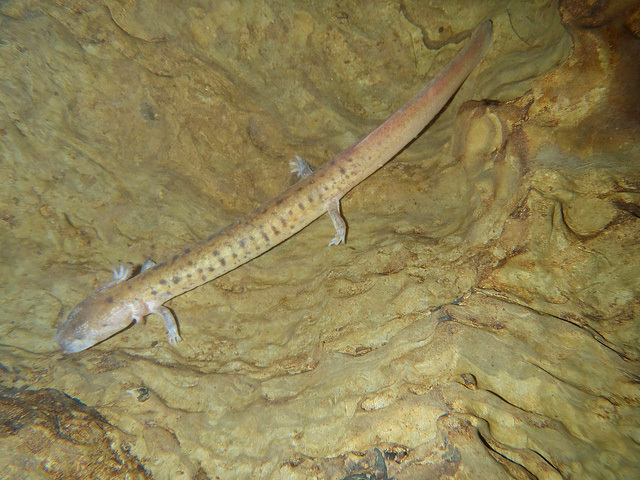 Other species of salamander that can be found in Tennessee caves: Dusky (Desmognathus fuscus), Cave (Eurycea lucifuga), Longtail (Eurycea longicauda longicauda) and Northern Slimy (Plethodon glutinosus). Submerged Tennessee cave salamander; photo by Alfred Crabtree on Flickr (use permitted with attribution / no derivative works).